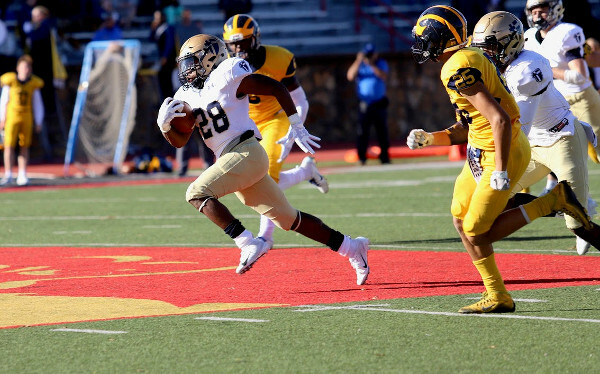 PITTSBURG – For three-and-a-half quarters, the St. Thomas Aquinas Saints appeared they would run away with the Class 5A state championship on Saturday at Carnie Smith Stadium in Pittsburg. The Saints built a 35-0 lead behind a consistent rushing attack, and had smothered a Wichita Northwest offense that entered the contest averaging more than 58 points per game. Northwest explosive offense seemed to seize momentum in scoring three consecutive touchdowns in the second half to pull within 35-21, but Aquinas had an answer for every big play as the Saints captured the first state football championship in school history with a 49-28 win. Sophomore Tyron “Tank” Young broke a 67-yard touchdown run on the first play of the second half to extend the Aquinas lead to 28-0. A few minutes later, Young broke a 62-yard run to extend the Saints’ lead to 35 points. But on the first play of Northwest’s ensuing possession, Roy Johnson broke around the left side, spun away from a defender, and raced 64 yards to get the Grizzlies on the board. After an Aquinas punt, Northwest quarterback Reagan Jones hit standout running back Breece Hall on a seam route for a 77-yard touchdown. Hall’s 1-yard touchdown run early in the fourth quarter cut the lead to 35-21, and gave the Grizzlies all the momentum. Then game the play of the game. Facing a third-&-16 from their own 23-yard line, Aquinas quarterback Tate Raboin faked a pitch to the left as the Saints flooded that side of the field, except for Jack Gabel who Raboin found wide open on the tight end cross for a 70-yard touchdown down the right sideline. The Saints had regained a 42-21 lead, and stifled the Grizzly comeback. Northwest drove inside the red zone with under five minutes remaining in the fourth quarter, but Jones’ pass was deflected and intercepted in the end zone by Aquinas safety Elias Carson. The Grizzlies would pull within 42-28 with 1:37 remaining as Jones threw a 10-yard hitch route to Kiron Patterson who then tossed the ball to a streaking Hall who raced the remaining 71 yards down the sideline for a touchdown. Northwest’s ensuing onside kick attempt was fielded cleanly by Finn Barnett who raced untouched 50 yards for a touchdown to put the Saints up 49-28. Young led Aquinas with 329 yards rushing and four touchdowns on 34 carries. Aquinas won the battle up front on both sides as the Saints rushed for 360 yards in the game and limited Northwest to 110 yards on the ground. The Grizzlies entered Saturday averaging 410 yards rushing per game. Hall, an Iowa State commit, was limited to 28 rushing yards on 12 carries, but was a factor in the pasing game with three receptions for 189 yards and two scores. He finished his senior season with 2,127 rushing yards and 29 touchdowns. Raboin was efficient in passing for 133 yards and two scores, including the long touchdown pass to Gabel, and a 33-yard strike to Theo Grabill late in the first quarter that put the Saints up 21-0. Jones finished with 283 yards passing and two touchdowns for Northwest. The Grizzlies went to the air after managing only 69 yards of total offense in the first half. While the state football title is the first in school history for St. Thomas Aquinas, Saints head coach Randy Dreiling won his eighth overall state title. Dreiling led Hutchinson to seven titles in a dominant run before taking over the Aquinas program in 2014. Aquinas finished the season 12-0, while Northwest finished 12-1. STA: Tyron Young 34-329; Joe O’Leary 2-21; Finn Barnett 4-12; Charlie McCormick 1-2.